A couple of days ago the first part of my birthday giveaway ended, now it's time for part 2!! I've been planning this for some time now and I'm glad I can finally show you all I have for you. I've shopped at all of my favorite stores, so each and everything in the giveaway reflects me. I want as many of you to win so each thing will be won by different people. Good luck to everyone and thank you so much for all the birthday wishes!! It's a toss up.....ad space or Etsy credit! I'm in love with that clutch!!! The Knit Kit looks very fun! you blog is uber cute! new follower! I would love that owl mug! I'm pretty sure I'd use it daily! wow! how great! happy birthday to you! Happy birthday! 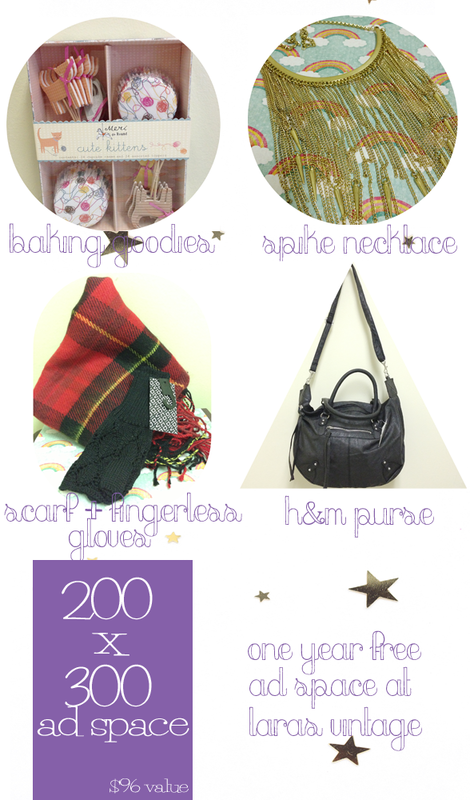 Really like all the goodies- I could always use a really awesome plaid scarf! Honestly, ALL OF IT. That amazing scarf, those gorgeous fingerless gloves, that AWESOME h&m purse?! Seriously this is probably the most amazing giveaway I've ever seen. I would KILL to win these gifts! What a great giveaway! I'd love to win the owl mug and have the ad space too! I'm excited about all that ad space! That is amazing!! So many cute things! I've actually been looking for a new black purse much like that one from H&M. I looove that necklace, the owl mug, the etsy credit, and the ad space! I've also always wanted to see that movie (Amelie). Great giveaway! What a sweet giveaway and happy happy birthday to ya! Happy birthday to you. I'm excited about my very own birthday that's coming up in a month! That owl mug!!! I love it! 200x300 ad space! happy birthday! That clutch is absolutely adorable! Very cute! Hope you had a wonderful birthday! Happy birthday & thanks for the awesome giveaway! Happy Birthday girlie!! Thank you for this amazing giveaway! I would definitely be stoked to win a year of ad space on your blog, the Etsy card and the H&M purse! The necklace or the wallet or the book or even the add space. Heck, they all look good! 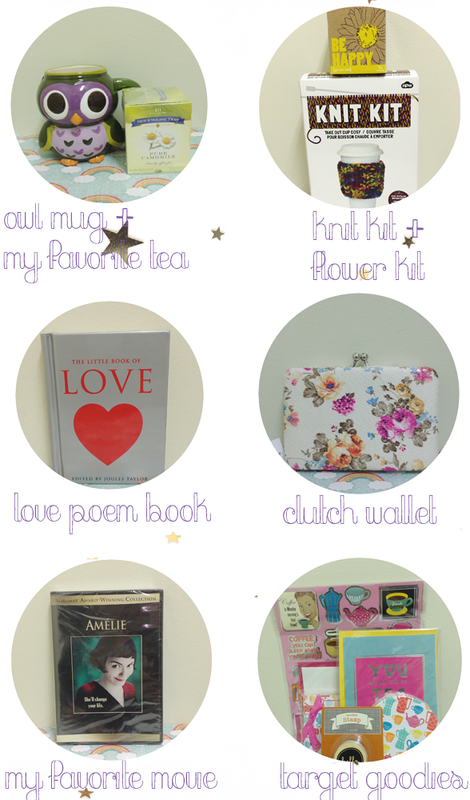 What lovely prizes and I especially love that they reflect who you are! Of course, I'm drawn to the ad space and Etsy credit but the owl mug is adorable, the clutch down right cute, and the knit kit is spendid (I did't know such a kit exists!) Thanks for the opportunity! It looks fabulous. I'd love the knit kit for my mom. She loves knitting and I think she would just love that one! They all look super cool! I love the knit kit though.